Clearly Michael Jackson's This Is It has a life of it's own. I saw this movie at 10:30am and boy did I get a surprise. I was expecting an empty theatre this early in the morning. It was packed. I also expected the audience to begin dancing in the aisles from the onset. Not the case. My expectations were way off. A few minutes into this unbelievable, one of a kind film, tears welled up in my eyes and began streaming down my face. I put my half eaten bag of popcorn to the side and my napkins turned into tissues. I know I'm not alone when I say Michael Jackson had been absent from my life... a life he had been very much a part of many years ago. I remember being put in a long time-out in 3rd grade for wearing a green and purple sequined version of his glove, homemade by my mother. A "long time out" is good way to describe what Michael Jackson has been in for many of us. In the documentary This Is It, he is back! Wow! From the films first song, Wanna Be Startin' Somethin', the talent, emotion and love of Michael Jackson strikes you, no matter what age you are. If you're a Gen-X'er then you will be quickly catapulted into a brief self-analysis of your life. A sort-of evaluation of what has happened to you since you last saw this man like this! Then comes the rush of emotions aided by the music of course... past, present and the finality that you are watching him for the last time. Napkins turn to tissues all over again. As I wiped the tears off my face, shocked and embarrassed, I popped my head up to look at the rest of the audience. It seemed people were having a similar experience to mine. One can't help watch this incredible film in shock and awe - just to be clear, a good, thankful, wonderful version of "shock and awe." It's almost as if we were destined to have this last piece of Michael Jackson no matter what. This Is It is now the highest grossing documentary in history. Behind the camera capturing these revealing, special and final moments with Michael Jackson was Videographer Sandrine Orabona. She is a small documentarian in comparison to the epic scale of what the film now represents on all levels. As the world shares these moments with Michael in this extraordinary documentary one can only imagine what it must have been like to be six feet away from The Magician at work! Please tell us Sandrine. TB: I just saw This Is It. SO: So what did you think? TB: I was blown away. I think I was all business walking into it. Then everything hit me and I was a disaster. SO: A disaster as in crying? TB: I started crying and crying and crying. SO: Do you know how many people said have said that to me? TB: Yes, yes and I mean I wasn't expecting any of it. I think it was a combination of his life, what he represented in my life, his talent and the finality of it all. SO: I'm so happy to have been a documentarian on it and even to just have been in the presence. I think that what the Director, Kenny Ortega, was able to do is to distill the emotion that we all felt while we were there during rehearsal. Everybody hired on the crew were very good at what they do all the way up. We all felt so gifted and fortunate to be on the project and to be around this man because of everything he represents, because of how amazing he is as a musician, as an artist and just to be in a room with him while he was rehearsing, performing or going through the paces. Just being around his process everyday, I would come home and just be like I can't believe I'm a part of this, I can' t believe what I lived today. And everybody felt that. My friend Chucky, wearing the green jacket, he is an Emmy award-winning choreographer. He won an Emmy for choreographing the High School Musical films with Kenny Ortega. He dropped a potential project to audition as a dancer with no guarantee that he was going to be a dancer. He got the job and everyday he would look at me and be like, "I can't believe I am living this." Now this is a man that not only is he a dancer, but he is an Emmy winning choreographer, ok, so it was not lost on any of us, you know how amazing this experience was. I think it is really captured in the film. SO: You mean as far as his comeback? TB: Well this was the beginning of his comeback, so he's been absent from the stage for a long time and the movie allows you to get to know him again, it's makes you appreciate his talent all over again and then in the back of your mind you know he's gone... and this becomes a one, two, three punch that the audience can't help but be effected by when they watch the movie. SO: It's a really powerful piece of work because, for everything that you just stated. And I think what's really important is that Kenny chose to focus on the experience that we were living in the moment, this piece doesn't focus on the fact that he's passed already because it is understood. I think that the power of it is drawn from the experience that we all had and by focusing on our experience, people are able to embrace essentially what we lived [during the rehearsals]. I had a friend say to me, "I felt like I had a front row seat to this experience". And I replied, "That's cause I did." I was there. If you feel in your seat like Michael Jackson is performing Billie Jean six feet away from you that is because he actually did perform Billie Jean six feet away from me. If you feel that power coming through the screen, you can imagine what I felt on stage when that was happening. And you can see that too... there is a handful of us, I turn the camera around and it's like fifteen crew and dancers on the floor watching and they can't believe what they are seeing. That was the experience. TB: Can you describe the amped up feeling you had at that moment? SO: It's exactly what you are talking about in terms of when you go see the film. It's like genetically we all have Michael Jackson inside of us. In some way or another because of the way we grew up. We listened to his music and we realized what a genius this man is. And then also we [the crew working on this] are all professionals and we appreciate that even more as a dancer, as a musician, as a documentary filmmaker we understand that side of it even more. And then all of a sudden all of that comes up in you and you're like I'm watching a man that I've seen on TV, that I've appreciated from a distance, doing what he does best six feet away from me. And I've got his team of crew members behind me feeling the exact same and the only reason I can't do it is because I'm holding the camera. So many times I caught myself dancing while I was shooting. The bassline for Thriller just moves right through you. TB: A very cool moment was when he vocally did the little guitar thing in the rehearsal for Wanna Be Startin' Somethin' to show the way it was to be done. He made the guitar sound so well and for a long enough time that it actually sounded like a real guitar. SO: Watching a process for an artist like that... I am in awe. For the legends like Michael Jackson or Martin Scorcese, to just be around their process and absorb that like a sponge it's like an apprenticeship. Just watching these people work is like a gift. TB: Any comments on the process you saw while filming? SO: Everybody that was on the show, like Kenny Ortega, Michael Bearden, Travis Payne and Michael Bush. These are all people that have been around Michael for a long time and they are also great artists in their own rights. There is kind of like a creative short hand they use rather than a lot of technical jargon. Like when Michael says; "make it sound like you are dragging yourself out of bed" It immediately evokes an emotional reaction and you can then translate that into the music that you are making and I thought it was a brilliant way of conveying that emotion. TB: Did he have down days? SO: No. Because of the level of energy that everyone shared, I didn't even have my down days. What you see is what you got everyday at rehearsal. Everyone from Michael on down was really focused and on their way to creating this amazing show. TB: Something that jumped out at me... his hands. They just came out of the screen, like the hands of a magician; they were all over the place. SO: I was so focused on my little screen [in the camera] that I never really noticed that but a number of people have mentioned that to me. TB: One of my favorite parts of the movie was when he started working on Human Nature, the creativity and the spontaneity of that. SO: But that's what I'm talking about. That is the kind of creative short hand that was flying all over the stage. It was a very creative space for everyone involved. All of the musicians were spot-on. TB: Everyone was front and center and ready to do their best. SO: Well you don't get that kind of job without that though, I mean, front, center and incredibly happy to be there. Everybody. Grateful. TB: I was really expecting people to be dancing in the movie theatre and I could actually here crickets. It seemed like the audience was in shock, overwhelmed and grateful to being seeing it more than anything else. SO: Different people have different experiences; I think it depends on the audience. I have seen it a few times and they've all been different. With the crew it was very much like reliving it. I have seen it when the audience has been dancing and also seen it with a crowd that experienced it very much like you did. I see new things every time I watch it. 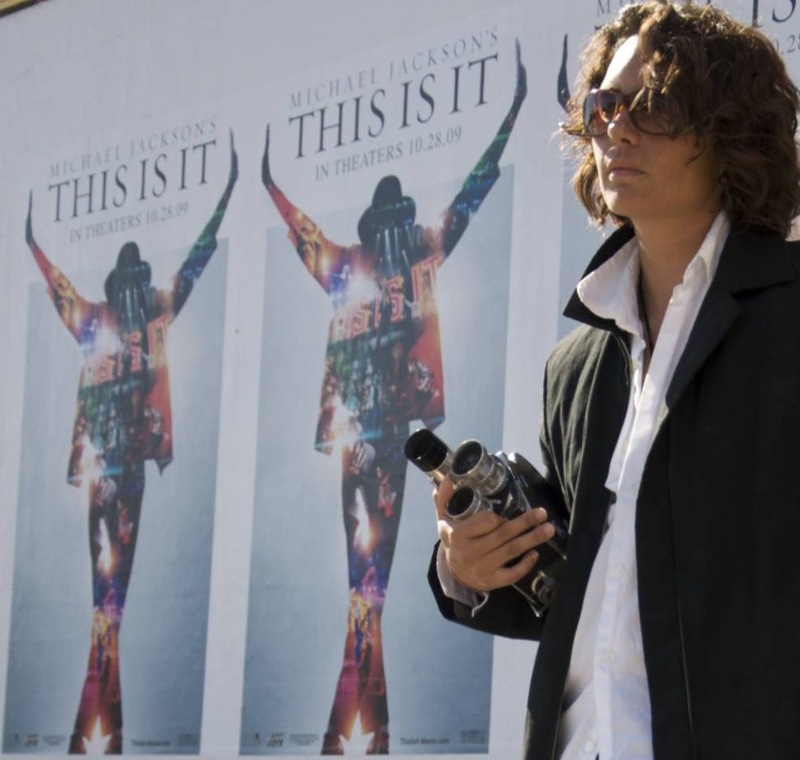 TB: The film is important, thank goodness you guys were there to capture it otherwise we may never have had anything like it with Michael Jackson. SO: It was one of the things that made it so special for me at the time. The fact, that I personally had never seen anything like this before. I had never seen this side of Michael Jackson. To this day I continue to treat it as an incredible gift. I think a lot of people feel that way now that they've seen the documentary. TB: A random thing --E he was wearing a shirt with Popeye gambling on it at one point. SO: That's Michael Bush right there. That's the incredible art of Michael Bush. TB: Was that rehearsal costume? Or everyday clothes for him? SO: Michael Bush dressed Michael Jackson. Always. TB: How did everyone deal with news of his passing? SO: It was a very difficult day. I was actually there shooting at the time and I almost dropped the camera. I had to shoot on my knees through the better part of that moment. I was overwhelmed with the emotion and I was like, "Ok, I am going to pass out". But I couldn't because I had to film. The way I can describe it is... the entire world was mourning that day, imagine how it was in the rehearsal space. I have a hard time remembering it actually. I feel like I had an out-of-body experience. TB: Were you a fan of his growing up? SO: Who wasn't? But I have to say that I am even more of a fan of his after having done this and observing him as a professional. SO: A documentarian, more specifically a music documentarian. A documentarian, shooter and editor. TB: Can't wait to see what you do next. Thank you.